Infrastructure-as-a-Service: Computing power, storage options, and advanced networking that integrate with your vSphere environment. A Platform for Enterprise IT: With app modernization, dev/test, and disaster recovery, you can address business needs without changing processes. Robust Hybrid Capabilities: Workload portability, seamless networking, and common management make it easy to extend to the cloud from on-premises environments. The first public cloud to integrate with both VMware NSX and vRealize Cloud Management Platform, vCloud Air was designed specifically with enterprise needs in mind. 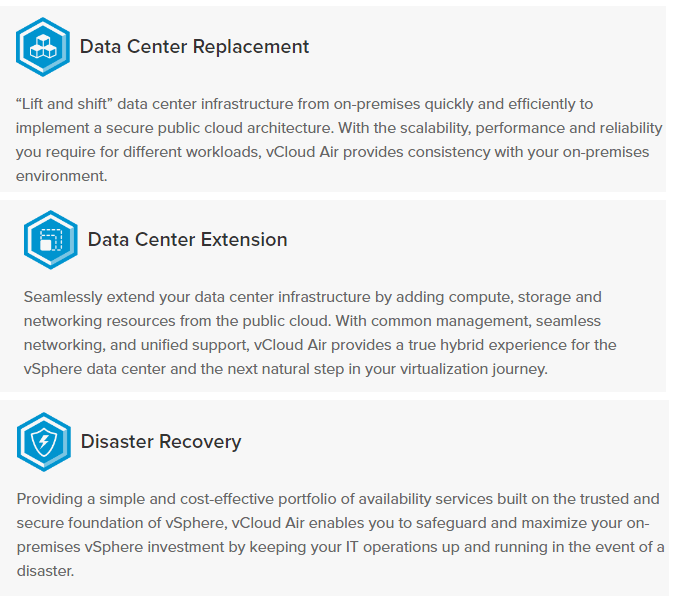 vCloud Air delivers a true hybrid cloud experience, and is uniquely positioned to solve critical IT challenges—whether you need an affordable disaster recovery option, an efficient way to extend your data center, or a complete data center replacement.